For me to grow in holiness, God has graciously provided several instruments, the Holy Spirit, His Word, and other people. 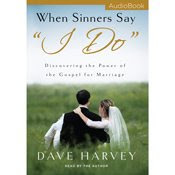 Pastor Harvey, using the narrative of David and Nathan, points out that in God’s relentless love for us, He pursues sinners and that He uses sinners to pursue sinners. We just finished chapters about mercy and forgiveness, but what do we do when our spouse needs correction? Hebrews 3:12-13 speaks that we are called to correct, exhort and speak truth to the one we love. 1. Pastor Harvey starts with the narrative of David and Nathan. Have you ever had to be a Nathan to someone? What were your feelings and thoughts as you approached the situation as you went through it and the results afterwards? 2. If you are to be a Nathan to your spouse, what are the character qualities necessary? What are the issues of character that would be unhelpful? 3. Pastor Harvey stated to be good spiritual surgeons, 3 spiritual qualities were necessary – wisdom, courage and meekness. What quality do you need the most? Which one second and which one third? Why did you place them in this order? 4. Review the questions on pages 124-136 and which ones do you need to remind yourself most often? 5. Biblical repentance is often misunderstood and minimized and/or disregarded. What did you learn about repentance? 6. How do you need to grow in meekness?